Here at Neo we’ve been thinking hard about how we can live more sustainably. We decided that it was time to venture beyond the studio and get our hands dirty, so we got in touch with Moulsecoomb Forest Garden to see if we could borrow a trowel or two and get involved in their great community garden project. Moulsecoomb Forest Garden and Wildlife Project is much more than a collection of well-loved allotments. We soon discovered it to be a hive of activity, offering opportunities for children with learning and behavioural difficulties to develop skills in horticulture, carpentry, woodland management and cooking, as well as being a haven for them to relax and socialise. The Forest Garden staff and volunteers work hard to teach their pupils to respect the environment and live off the land. It was so inspiring to see the variety of vegetables that are being organically cultivated and used to top the pizzas that are cooked in the project’s wood-fired oven. The Garden’s abundance of fruit doesn’t go to waste either – it’s whizzed up into delicious smoothies using the pedal powered ‘smoothie bike’. We arrived at the Forest Garden Project eager to do our bit for our local community project. 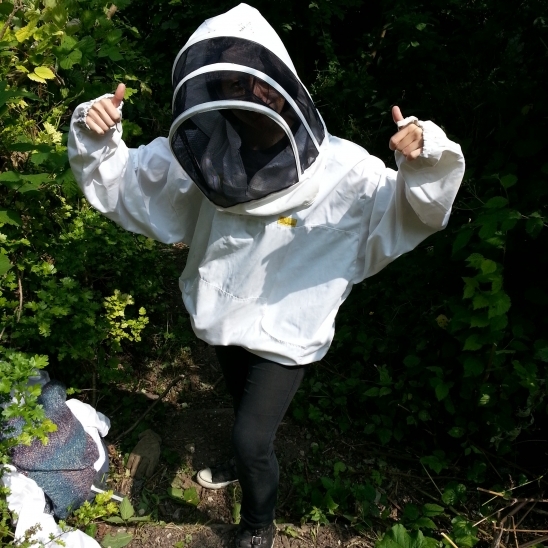 We left with woodwork skills gleaned from a very talented young man, a taste for peas straight from the pod and a priceless photograph of our own Emmie in some fetching bee-keeping gear. We can’t wait to get stuck in again next month! The win was the perfect conclusion to the year-long campaign that also raised over £50,000 for WWF-UK. We'll raise a cup to that.